What better way to say thank you to valued client or to someone who has helped you in some way than to give them a hamper full of tasty treats? You'll find a great selection on offer here to suit all budgets offering eveything from delicious fruits to champagne and chocolates, so you're sure to find the perfect gift for everyone. Where do I use my Virginia Hayward voucher code? Choose a code you would like to use, click it and copy it then follow our link to the Virginia Hayward website. Add the hamper you would like to your shopping bag and when ready to proceed, click on your basket icon in the header. Under the order summary, you can add a discount code into the box provided and click 'Apply Discount'. Your discount will be applied to your order automatically allowing you to check out for less. Follow Virgina Hayward on social media to find out about any offers as soon as they go live. A leader in the luxury wine and food hamper industry, Virginia Hayward has been supplying luxury hampers for over 30 years. Their hampers make suitable gifts for many occasions such as Christmas, anniversaries, birthdays and even the arrival of a new baby. Choose from traditional hampers, drinks hampers, chocolate hampers, speciality diet hampers or hampers full of pampering beauty products, there's something here for everyone and to suit all budgets. Their hampers are also ideally suited for corporate gifting. 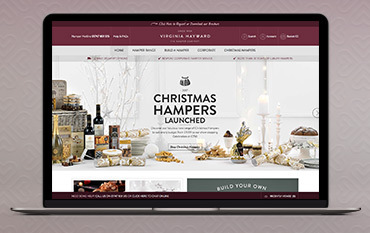 Virginia Hayward offers an extensive range of hampers but if you can't find exactly what you're looking for, you can build your own. It couldn't be simpler to build your own personalised hamper with their online hamper builder. Just choose a hamper, and then fill it with treats of your choice from their huge range of over 700 items. You are then able to customise your hamper with your own unique design and message and you can even choose to upload your own image. Et voila! a truly unique and personalised gift! A discount code from Virginia Hayward is a rare and beautiful thing. They do offer discount codes, on occasion, which will save you money on select hampers or a discount on any order, but, if codes are not available it's still worth checking here at NetVoucherCodes because we will make sure that you are aware of any sales, savings or discounts that might be on offer at Virginia Hayward, so you can buy the ideal gift for less. Can I add a personal message to a gift hamper? Yes there is an option to add a message of up to 300 characters on any hamper, 5 lines of 60 characters each. Is there allergy advice online for hampers? Yes each product page has a pdf listing all the allergy advice. This is also stated on the information of each hamper. Can I track my order once I have placed it? Yes, simply log in to your account and click the 'My Orders' link and you can track your hamper from there. If your order was placed on the phone, this can also be tracked on request. Established in 1984, Virgina Hayward has been providing luxury and bespoke hampers to both businesses and for personal gifts ever since. They provide a wide collection of gift combinations that are perfect for every occasion to truly show how much you care. And with one of our Virginia Hayward voucher codes and save money on some tasty treats. They sell a wide range of hampers including special occasions such as Wedding, New Baby, Christmas and more, plus with a wide price range - you are sure to find the perfect hamper to suit your needs.